Chi-Chi is… confounding. Yeah, let’s go with that. He has a whole lot of avoidance, a whole lot of speed (465! ), and a heal with Tranquility, so we’re behind the 8-ball before we even start. Unlike Yu’la or Zao where I could kind of pick & choose from a few strategies and arrays of pets, I had to come up with a fairly concrete strategy to beat him. This is a huge twist from my typical preferred strategies, but it involves DoT and debuff stacking. I know, contain your surprise. But in this case, rather than just being my preference, it’s a really solid way to go about it, because Chi-chi’s Ethereal ability (the mechanic is pretty much identical to Deflection) doesn’t dodge most DoTs. Ethereal is on such a relatively short cooldown that in trying to write a strat it was pretty central to my frustration. I tried a makeup where I use that ‘down’ turn to cast buffs or build barriers, but it wasn’t nearly as successful, in some part because I’m awful at counting. The Fetish is kind of a weird choice, I know. Black Claw, my BFF, has a duration far too short to stack DoTs meaningfully so that was out. 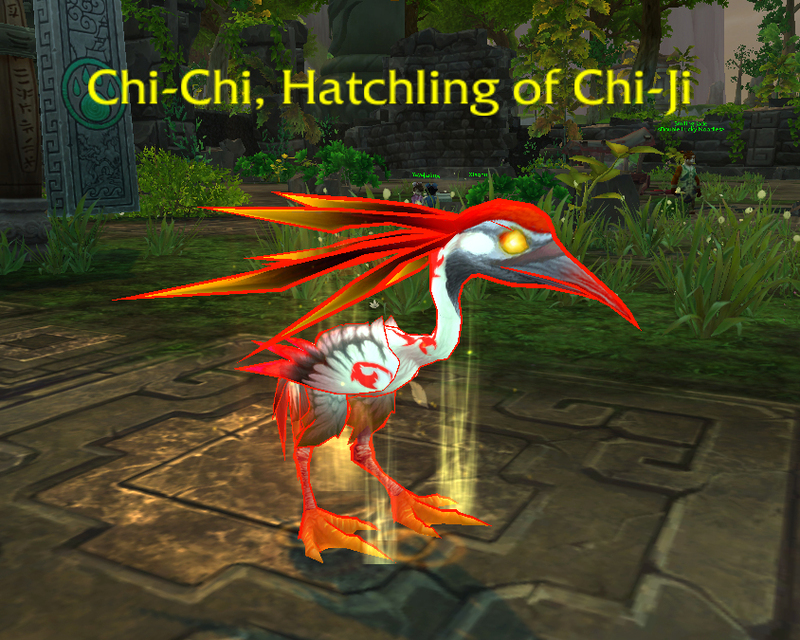 I had some success with raptors with Exposed Wounds, or other pets with Wild Magic, but Ethereal plus the somewhat variable nature of Chichi’s only offensive ability, the new elemental Fire Quills, made it very hard to predict when my first buff pet would die. The Fetish, as far as I can tell, is the only pet with a buff like this which is also in the undead family. Because Chichi always goes first and doesn’t have any kind of delayed nuke or DoT spells, I’ll always have 2 turns as a risen Undead, so even with that blasted Ethereal, I can ensure an almost-full duration Wild Magic for the Disgusting Oozeling to stack its DoTs. The Fetish also has a decent DoT of its own with Flame Breath. There’s a bit of leeway with the Oozeling. You can also go with the Oily Slimeling, Toxic Wasteling, or the Jade Oozeling. The two really key abilities here are Acidic Goo, and Corrosion, both of which have an additional multiplier on top of their damage over time spells. 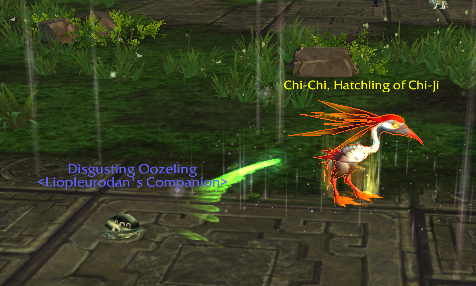 Chichi should die by the time your Oozeling does, but sometimes there’s a tiny bit of damage left to do, which is where the lantern comes in handy. You miiiight be able to get by with Acidic Goo and another, non-multiplier DoT, but I make no promises. The reason I chose a lantern is because it has a lot of burst, just in case Chichi decides to be a jerk on that last turn and whip out a Tranquility. You do need to continue to keep Ethereal in mind, though… there’s nothing more frustrating than having your huge nuke dodged because your long-cooldown Blind got absorbed. 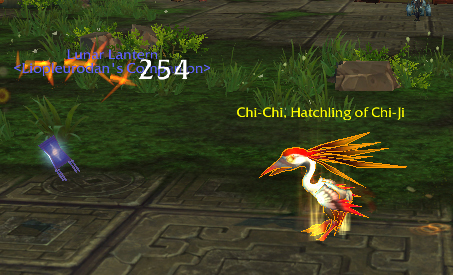 Most magic pets with good burst will do alright here, because you’re just trying to finish Chichi off. This entry was posted in strategy, tamers and tagged 5.4, celestial tournament, chichi on September 1, 2013 by Liopleurodon. Great strat! :) Instead of the Disgusting Oozeling, though, I used a Rapana Whelk with Ooze Touch, Acidic Goo, and Dive. That way, I still get the dot and since it’s a critter, it takes less damage from fire quills. Yeah, that 2nd pet seems to be a little flexible as long as you have a good amount of DoT damage. For Live, I’d actually forgotten to finish leveling my Oozeling, so I ended up using my last undead res turn with the Fetish on Rot, and then blew him up with my Kneebiter. A critter in that slot is definitely an excellent suggestion. Yep, definitely overlooked him. Boo. 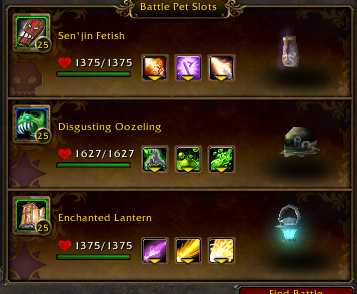 :( To be clear, I mean the Sen’jin Fetish, from the Argent Tourney (which is like, 2-5K gold on most AHs), not the Fetish Shaman (which is from the CE of Diablo 3 or something). I try to write strats that don’t require ultra-rare pets without a comparable swap (eg, Emerald Whelpling vs Emerald Proto-Whelp). But regardless, more options are always better. Thanks for reading, and thanks for the correction! Chi-Chi might have the simplest strategy. 2 snail pets. Strong defense against Chi-Chi’s only attack and with Ooze Touch and Acidic Good back to back snails should either kill him or let you burst him down with a final magic, like a lantern or the wisp. I tried a single snail on PTR, but I wasn’t able to grind him down before he healed. Admittedly, it was early on in the testing phase when I ruled him out, so he’s likely been re-balanced since… I know I’ve been seeing lots of mentions about snails & the Black Lamb in particular since it went live. Thanks for the input, though! I appreciate it.